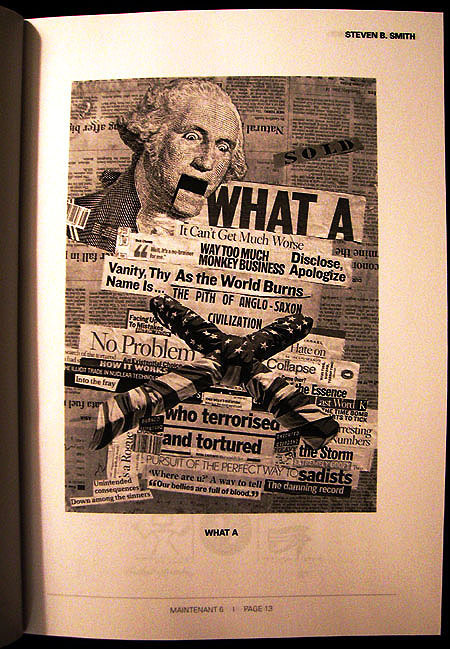 I have a collage in MaiNtENaNt 6: A Journal Of Contemporary Dada Writing & Art published out of NYC. I was expecting a self-produced chapbook, but what arrived today is a top-shelf professionally printed professionally edited fantastic book full of worth, mirth and surprise . . . IF you’re into Dada — most of the art contains words and much of the poetry is experimental and enigmatic, but a good read nonetheless. MaiNtENaNt 6 is 6.75″ x 9.5″, 130 pages, featuring 123 international writers and artists (six of whom I know) and may be purchased at threeroomspress.com/2012/03/530. 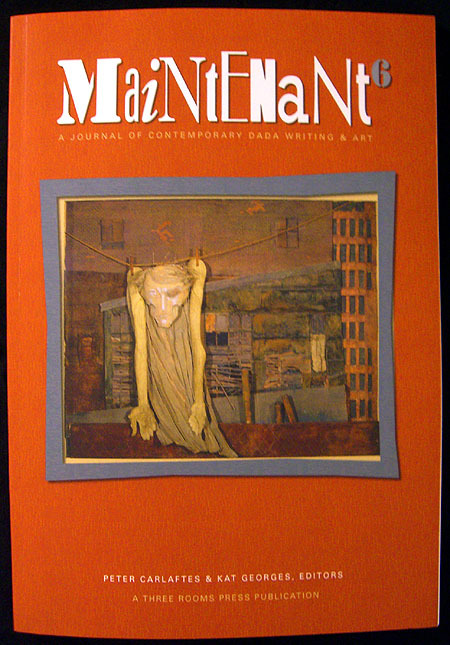 The magazine is called MaiNtENaNt in honor of Arthur Craven, an idol of the Dada and Surrealism movements who was born in Switzerland in 1887 and disappeared off Mexico in 1918 — thought to have drowned at sea trying to sail to Argentina to be with his poet artist wife Mina Loy, whose artwork graces the cover. Born Mina Gertrude Löwry (December 27, 1882 – September 25, 1966) was an artist, poet, playwright, novelist, Futurist, actress, Christian Scientist, designer of lamps, and bohemian. She was one of the last of the first generation modernists to achieve posthumous recognition. Her poetry was admired by T. S. Eliot, Ezra Pound, William Carlos Williams, Basil Bunting, Gertrude Stein, Francis Picabia and Yvor Winters, among others. From 1911 to 1915 he published a critical magazine, Maintenant! (“Now!”) which appeared in five issues. It was gathered together and reprinted by Eric Losfeld in 1971 as J’étais Cigare in the dadaist collection “Le Désordre“. The magazine was designed to cause sensation and in a piece about the 1912 arts salon he criticized a self-portrait by Marie Laurencin, remarks which drove her lover and influential modernist critic Guillaume Apollinaire to fury and a bid for a duel. But his rough vibrant poetry, and provocative, anarchistic lectures and public appearances (often degenerating into drunken brawls) also earned him the admiration of Marcel Duchamp, Francis Picabia, André Breton, and other young artists and intellectuals. I’m honored to be in the magazine; even more pleased that the editors came across my work in AgentOfChaos.com and emailed me asking me to submit. I would have been heartbroken had they’d rejected me after that. 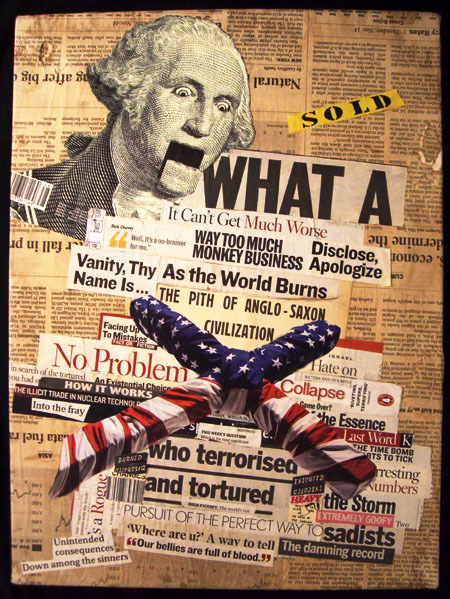 This entry was posted on Thursday, March 29th, 2012 at 9:02 am	and is filed under Art, Photography, Publications. You can follow any responses to this entry through the RSS 2.0 feed. You can leave a response, or trackback from your own site. ooh, and on page 13 too.excellent. congrats!